With T-Mobile’s Simple Choice plan offering “unlimited international data and text while roaming in 120+ countries and destinations,” it was easy to forget that unlimited roaming doesn’t apply domestically. A few weeks ago I was on vacation in a scenic area of my own state state, up north on Mackinac Island, a major tourist destination that accommodates close to a million visitors annually. 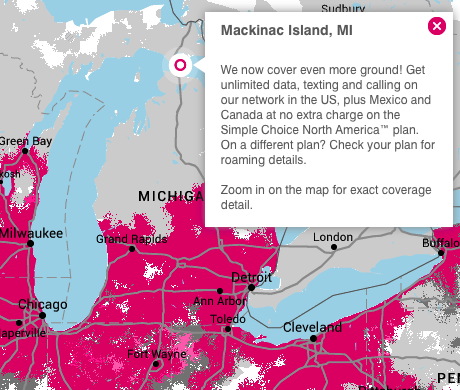 Had I thought to check in advance, I would have seen that Mackinac Island is way out of the T-Mobile coverage area. To my surprise, on my first night there I received a text message saying that my 50 MB data roaming limit had been reached. While they wouldn’t charge me anything, they’d just cut off my internet access. How kind. I called customer service, and they offered to give me another 50 MB data package as a courtesy. Now this is not 1990, mind you. 50 MB will barely let you check e-mail a couple times, let alone accomplish anything else. I agreed, knowing it wouldn’t matter much. 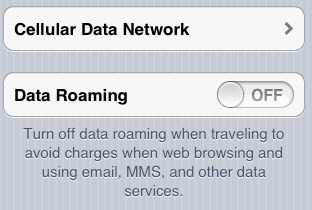 But then I took the obvious step of turning off data roaming. But it turns out that did nothing! A few hours later I was getting another message about running out of the quota, even though I had not enabled data roaming at all. From poking around the net, it seems that on iPhones and possibly other devices, all kinds of applications may use data even while data roaming is turned off. Many have been hit with high fees because of this. So I turned off cellular data completely. In the meantime another call won another “complimentary courtesy” package, this time of 1 GB of domestic roaming data. I didn’t really use that, because now I was afraid to turn on cellular data, and for the rest of the trip I relied on the hotel wifi (which worked just fine). It wasn’t a major inconvenience. Communicating with my party by voice or text was still possible and without additional charges. This wasn’t the end of the story, though. When I got back, my bill showed I had been charged for two different domestic roaming plans (as expected). But the (expected) credits for those did not add up to the charges, so now I had an extra $15 on my bill. It wasn’t too much trouble to get customer service to adjust this. T-Mobile customer service is efficient, easy to reach, and fast. So at least there’s that. But there was a lot of bother involved here. Finally, while it’s nice that T-Mobile doesn’t just start charging you crazy roaming charges when outside their coverage area, simply cutting off internet access is a bit worrisome. What if you you are actually in a remote area and need map or GPS services, for example? I suppose you’d stand in the middle of the trail, contact customer service, and get them to provide you with a roaming package. Let’s hope there are no hungry wild bison around.